The Elyria Police Department is mourning the loss of one of their own. 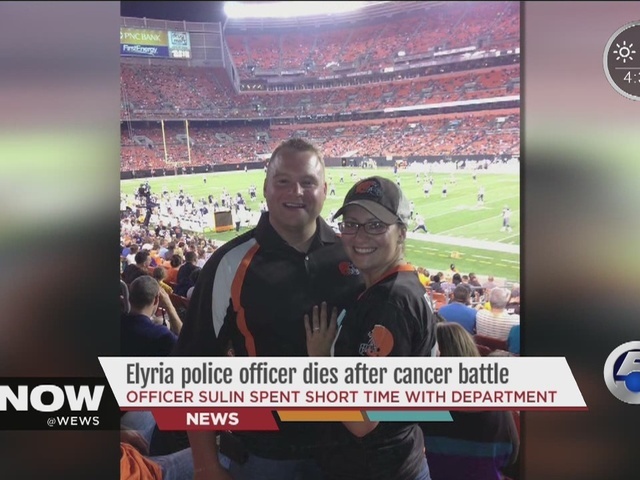 Officer Joseph Sulin lost his battle with cancer Saturday evening, according to Elyria police. The 29-year-old officer was sworn in with the department in March, after he spent nearly three years at the Dalton Police Department in Wayne County. Elyria Police Chief Duane Whitely told newsnet5.com it was refreshing to see an officer so eager to work in the community. "When you've been on [the force] a while, sometimes you need to see that to get back in proper perspective. He really wanted to be out there, he wanted to serve the community and do police work. He was very happy," Whitely said. According to Elyria police, Sulin, and his fiance Chrissy, just became parents to a baby boy nearly five months ago. A GoFundMe account has been set up for Officer Sulin's family. CLICK HERE to donate. Thursday viewing from 4-8 p.m.
Friday viewing from 10-11 a.m.
Friday service from 11 a.m. to 12 p.m.., followed by procession to cemetery. The cemetery is across Interstate 77 at Sunset Hills Memory Gardens, located at 7920 Frank Ave. NW, in North Canton.